Do you know what today is? Wednesday already! 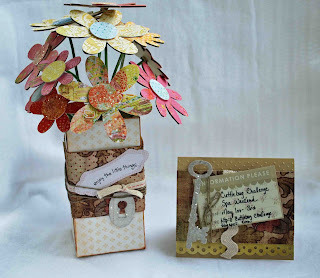 I had a blast working on this week's card for Cuttlebug Challenge's "Wednesday Be Inspired." 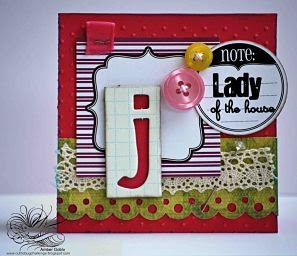 This week's challenge is to use your Cuttlebug + Monogram. Such a fun challenge with so many different options, I can't wait to see what everyone creates! We got to play with products from Elle's Studio. The purple tag behind my monogram and the circle NOTE tag are both from Elle's Studio. I added a Melissa Frances rub on to the NOTE tag. I used Colorbok and My Mind's Eye paper. 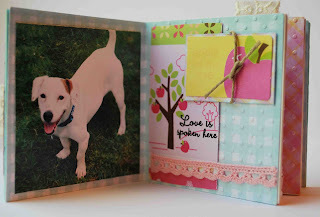 I embossed my card with my Cuttlebug and the Swiss Dots folder. Then I threw on some lace and buttons for a girly look. The chipboard is Making Memories. I made this for my friend Jo, she loves bright colors and I think this card is perfect for her! Now grab your Cuttlebugs and get to work. And be sure to stop by Cuttlebug Challenge to see the DT's beautiful creations. Hope everyone is spending a nice & relaxing Memorial Day with family and friends. I'll be working! But I had a wonderful weekend spent outdoors in the warm sunshine. We've had a lot of fun at the barnyard the past 2 days. 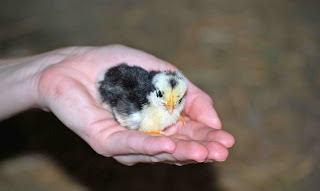 One of our chickens hatched 10 baby chicks. 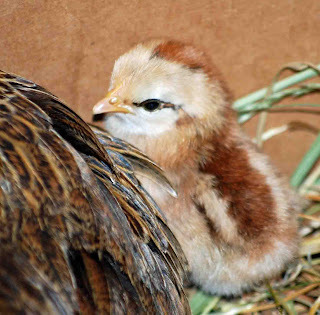 They are just adorable and the Mom is such a gentle chicken, so happy I could see the little guys when they first hatched. 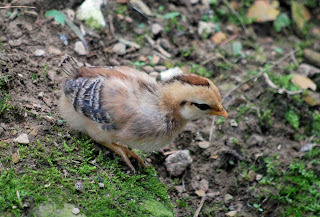 Here's pictures of 2 chicks. It's not easy catching 10 chicks being photogenic at once, but hopefully I'll get a picture of the entire group this week. I just adore the little fellow I'm holding in my hand, look at those beautiful colors. And some more exciting news. 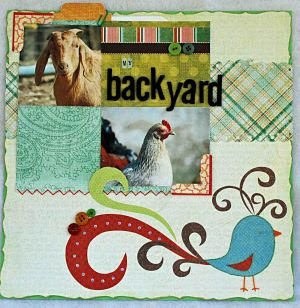 Scripture Scrappers has merged with Christian Paper Craft Magazine. 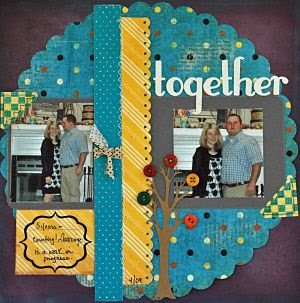 Our Scripture Scrapper team is now the Scrapbook Challenge Team at CPCM. I'm so excited to help get this magazine started! This is little Trigger. He's my husband's uncles dog. He was missing for 1 month and we were sure he was a goner with all the hunters and wild animals in the mountains around our house. Well we got a miracle, Trigger was found. He was living with a family who took very good care of him and kept him in the house with their poodle. I used my A Kiss On The Chic kit to complete this project. Laura's kits are great and you wouldn't believe how many supplies you receive! And the kits are priced low, I have no idea how she makes any profit including so much in these kits. And she purchases unique things from Etsy to add to her kits, so they will be unique. How many of you are watching American Idol? Me too! I vow every year I won't get addicted to the show and guess what, I'm addicted anyway! I want you to check this out, I was featured on Inspirationals. Thanks Mom! She asked if she could feature me and I'm thinking "are you kidding, YES!" I've always wanted to be featured so I'm very tickled! It was a beautiful day in Kentucky! Sunshine, blue sky's, warm temperatures...what more could a girl ask for? May is my favorite month because I know I have the entire Summer to look forward to. I'm definitely a warm weather person! Got a few new creations to share tonite. First, a wall hanging that I just adore. It came as a kit from A Kiss On The Chic. I LOVE Laura's kits, they are so beautiful and I can't believe you get so much for so little! And she loves buying things from Etsy to add to her kits, so they are unique! I got this chalkboard kit and mixed in a few items from my Home kit also. I just love the happy bright colors. If you've never been to A Kiss On The Chic, check it out! Next a card I made with my Home kit. 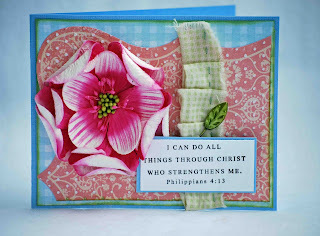 It is for a challenge at Christian Paper Crafts Magazine. The Bible Verse stamp is Papertrey Ink. Sometimes less is more, so I kept this card simple. 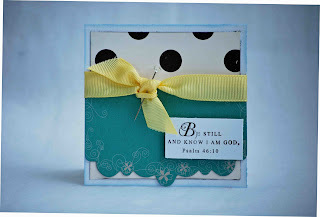 The challenge was to use a scripture and the colors black, tan, and aqua/teal blue. Now, on to some fun stuff! Farm pictures! 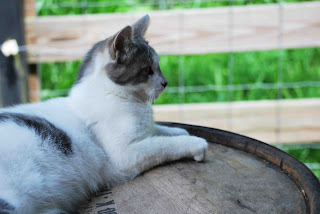 Mr. Kitty loves taking it easy at the barn. I'm never going to quit calling him "Ms." Kitty. 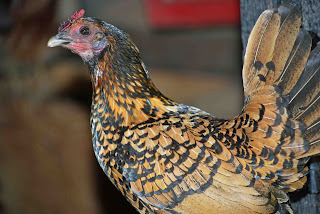 This is a picture of my oldest chicken Black Gold. Her feathers have kinda dulled with age and the other day I caught her napping and then she yawned. Who knew chickens yawned? Black Gold loves being a Mama more than anything. If any chickens hatch little ones, Black Gold hangs around to keep an eye on the chick. I think she's the "mid-wife" of chickens. We have a new addition to the barnyard, little Rain Drop. It was hatched last Friday during all the rain, hence the name! 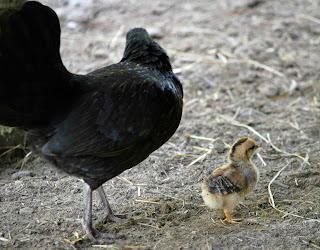 We didn't even know the black chicken was sitting, she just appeared one day with a chick beside of her! She is so proud of her baby. Just finished my first lesson at Scripture Scrappers. Check it out here. And be sure to check out the Scripture Scrappers forum! Hi everyone...do you know what today is? Yep, time for a new challenge at Cuttlebug Challenge. 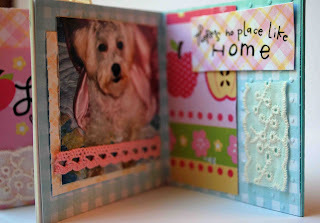 This week's challenge is to make a 3D project, anything but a card + your Cuttlebug. I had so much fun working on this project. We were sponsored by Create & Treasure Publishing. I got to play with the cutest board book. To create my project I painted the outside of my board book an aqua blue. 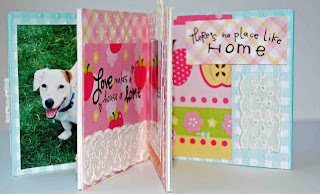 I used my Cuttlebug and the embossing folders Houndstooth and Swiss Dots throughout my book. I used paper by Colorbok, DCWV, and Making Memories. 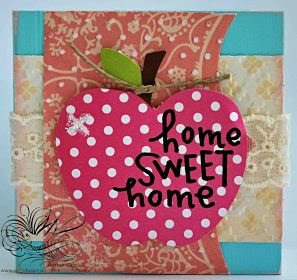 My apple embellishments and paper are from Oriental Trading (they have the most adorable scrapbook supplies!). I also used Melissa Frances rub-ons. I added some pictures of my babies, Jake and Gracie...Jake is the little "macho" Jack Russell and Gracie is my girly schnoodle (schnauzer + poodle). They were both rescues. And then a picture of me and Hubby in the center of the book. That's what makes our little family & our "Home Sweet Home". I did discover one thing, it is almost impossible to get good pictures of the inside of a board book. Don't forget, you still have time to be entered in a drawing for the Cricut Expression and Epson Artisan 700 All-In-One Printer at Cuttlebug Challenge. Can't wait to see what you make with your Cuttlebug this week! Is it raining at your house? I am starting to feel like Noah we've had so much rain the past few days! I know we need the rain, but I sure do miss sunshine. We had a few hours of sun today...just enough time to feed the animals and whoosh = downpour! Hopefully it'll be pretty for Church Sunday. We're having a cookout and an auction to raise money for the youth group. I have to LO's to share tonite...can you believe that? And now for my exciting news. I've been picked for the Design Team at Scripture Scrappers. If you've never seen their blog, click the blinkie to the right. Such an uplifting place to glorify God. Be sure to stop by to visit the Scripture Scrappers forum! Can't wait to get to work with the wonderful DT! Do you know what today is? WEDNESDAY! And that means a new Cuttlebug Challenge. This week's theme is Wedding/Anniversary + Cuttlebug. I can't wait to see your cute projects for this challenge! We were lucky enough to be sponsored by Creative Cuts and More, check out their store and amazing die-cut creations! This week I had the opportunity to use one of their purse boxes. It is just the sweetest little thing and I LOVED altering it. I made a "Love & Marriage" card, great to attach to a wedding or anniversary gift. All I did was run the front of the die-cut thru my Cuttlebug using the Swiss Dots folder. I then lightly ran MS ink over the top of the embossed dots. I then added a My Mind's Eye trim that I scalloped with a Martha Stewart punch. I used a Melissa Frances rub-on. 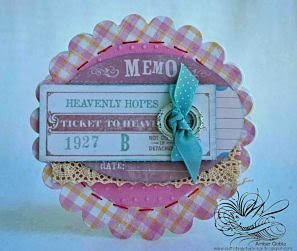 I then used Paper Studio pearls to border my paper and 2 Making Memories pins. 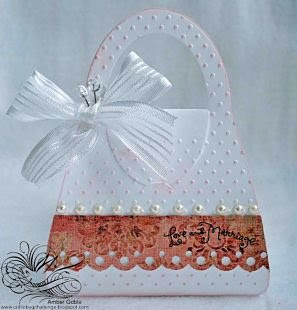 I think the pearls look great with the white embossing of Swiss Dots. And I added a MS ribbon for a bow at the top. Now, all you have to do is add a sentiment to the inside, a note of congrats, etc. and you're all set with the cutest altered card ever! And check out the Diecut Diva, the great blog showcasing the Creative Cuts & More DT's work. Now I want to see your Wedding/Anniversary creations using the Cuttlebug! And don't forget to check out the fabulous work from the Cuttlebug Challenge DT! Hi girlies! The only bad thing about blog candy is that I have to give it to ONE person and not everyone! I have LOVED reading all of your inspiring comments and plan on spending an evening hopping to all of my new followers blogs! I'm sure I'll find plenty of new inspiration! OK, now to the winner. I used Random.Org to pick my #, and the winner is DENISE!!! Denise said "Love that Dahlia. So so pretty! YOur flowers are adorable too. Very creative. To find inspiration, I search the net and usually find something to spark my creative juices. Thanks for the chance to win some fun blog candy! I've followed you!!" And now I want you to look at Denise's adorable blog. And check out her amazing photo frames at her ETSY store...see I'm already finding new inspiration! I'll e-mail you Denise! Don't forget to visit Cuttlebug Challenge on Wednesday for this week's new Be Inspired Challenge. Here's a little snippet of my upcoming project! Thanks a bundle for taking part in our Spa Weekend! Hi girlies! I can't believe how much fun the Spa Weekend has been so far! 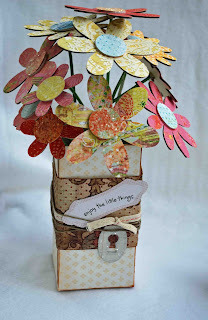 And what a great blog hop, I LOVED stopping by everyone's blogs to see their favorite flowers and how they relax. And thanks for all the wonderful comments...I've loved reading what inspires all of you! Can't wait to pick my blog candy winner on MONDAY! I hope you've stopped by Cuttlebug Challenge this morning and saw the awesome Baby Gift Tutorial that I got to be a part of....with the amazingly talented Becky Givans and Lea Lawson. I just wanted to add some details for my project so you know how I made it. The onesies were by far my favorite part of this baby gift set. 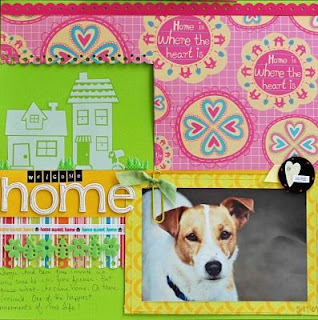 I used Inkadinkadoo stamps and Martha Stewart light yellow ink. 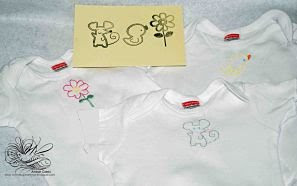 I stamped the image onto the onesie and then took needle and thread and stitched the stamp outline. And then I threw it in the wash (on gentle, with my fingers crossed that it would turn out perfect) and taadaa, it did! It looks like a custom onesie...this would also be a great way to monogram things, like towels, bags, etc. The sky's the limit. 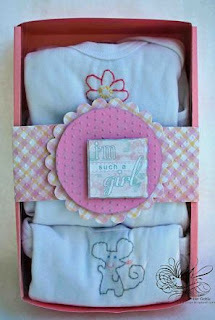 Next step was making the little onesie gift box. I simply took a piece of 12x12 cardstock and decided how big of a box I wanted. It is a 5x3 inch. I kept an extra 2 inches on each side for the sides of my box so it's really a 9x7in. I then scored the box where I wanted my sides to fold up to make it seamless and used my hot glue gun to secure the sides. I used a piece of transparency for my top. I then used my Cuttlebug and Nestabilities to cut out the cute flower using DCWV & Colorbok paper, Swiss Dots folder, and Melissa Frances sticker. I wanted to carry the flower theme thru the gift to give it a neat look. So I made a mini album out of a Clear Scraps album. I used the same technique for the flower, added some Martha Stewart Ribbon and a Melissa Frances Rub-On & frame. And for the card, yep same technique again with Melissa Frances Coupons, Frame, and MS Ribbon. Hope you've enjoyed the Cuttlebug Spa Weekend! 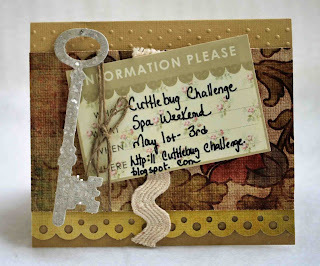 Cuttlebug Challenge Spa Weekend: Relax, Rejuvenate, BE INSPIRED! 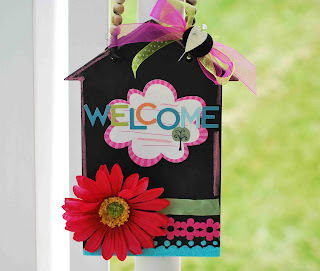 WELCOME TO THE BLOG HOP!!! So happy you've joined us! Hopefully you've decided to spend your weekend at our Cuttlebug Challenge SPA; relaxing, winning amazing prizes, and learning new scrapbooking techniques! You have from now until 10PM Sunday to complete the blog hop and be entered to win prizes galore! 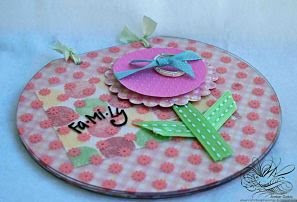 If you just happened by my blog today, go to Cuttlebug Challenge to start your blog hop experience. So when you think of relaxing, what comes to mind? My favorite method of relaxing is being outside, enjoying nature and the beautiful world around me. Nothing makes me feel better than sunshine and a warm breeze...and the best part, this relaxation technique is absolutely free! I am so inspired by the world around me, always thinking of new scrapbook layouts and cards just by being outdoors and enjoying the amazing world God has given us. So after you've completed the blog hop, grab your camera and go outside...see if you can find a little inspiration. Thanks so much for hopping to my blog! Now I have a little blog candy to give away plus you will be entered for Cuttlebug Challenge prizes, would you like details? 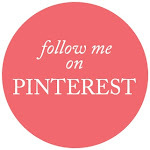 I'm giving away Martha Stewart stamps, Ribbon, and a Melissa Francis mini album... All you have to do is become a follower of my blog if you're not already and leave me a comment telling me WHAT IS YOUR INSPIRATION? 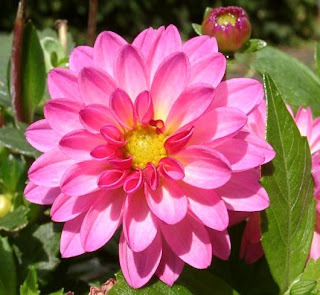 Then pick my flower, the DAHLAI...and continue on your blog hop to pick the next flower. And now, time to start hopping again. Your next stop, Maggie LaMarre's amazing blog. Just click on her name. Have fun!! !